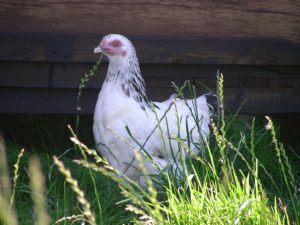 Light Sussex has that old fashioned look, lays 260 creamy eggs per year. 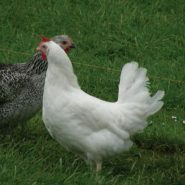 A firm favourite for a mixed flock.If you want the traditional flock look the light sussex should be top of your list. 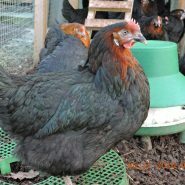 Light Sussex has that old fashioned look, lays 260 creamy eggs per year. A firm favourite for a mixed flock.If you want the traditional flock look the light sussex should be top of your list.This strain of the well known Light Sussex breed has maintained its original productivity whilst still showing the striking markings this breed is famous for. Well suited to domestic flocks and a must for farm shop type retail egg producers.We guarantee you happy healthy stock, free advice and guidance to keep your chickens healthy. We aim to have here everything you need to successfully keep your chickens. We have had Pearl our Light Sussex chicken for less than a week. She is definitely “top hen” and runs to greet us so she can eat out of our hands. She has laid two large cream coloured eggs already. A lovely girl.